Wow, wow, wow what a fantastic topic I so loooovvvveeee crystals and they have a major role in my life. There is no ailment that cannot be healed by a crystal and there is so many of them with a wide therapeutic index all of their own for us to choose from. I used to suffer with excrutiating monthly cycles until I discovered natural moonstone the brown creamy stone a number of years ago. I think the pain may have been so bad back then that I watched a piece of moonstone break clean in half after I'd taken if off my person following my mini crystal healing session to lessen the pain. I couldn't believe it as I'd only thrown the stone directly onto my bed which is soft. But my favourite crystals without a doubt are herkimer diamond and rainbow obsidian. I'm looking forward to checking out Star's link now. I do have some crystal ally cards that have similar principles as the energy of the crystals has been stored in the cards and you can carry the card in place of the crystal or just meditate on it. wow girl you really know your crsytals! i cant wait until i know as much as u do! 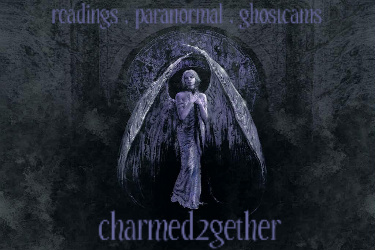 you'd be the perfect person to get the ethereal crystal attunements. there are 9 attunements in total. whats so amazing about it is that you dont need any physical stones at all. you just call upon them and point or think about the body part or chakra you want to place them and thats it! the crystal will come to that part in ethereal form and stay there for as long as needed. i know its sounds a little wierd but i think it works. its supposed to be much more powerful than real crystals too. if you go to this link it has all the notes for my attunement. you can read about every charateristic of the crystals. i will have all my attunements in a few weeks. i hope others will ask for this attunement cuz its free for pete's sake! please please ask me for help if ya'll want these attunements...its so easy and they really work! i just realized i have a ton of crystals that my sis gave me! i have like 5 pieces of amethyst and whole bunch of others...ive been categorizing them and turn out i got some of the coolest ones! Let`s just start with a and then work to z.I will just start with what my feelings say i should post,if anyone then has a stone in mind ask me and i will post it. 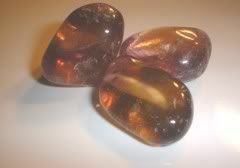 Probably the most famous place that agate is mined is Idar-Oberstein in Germany where it has been collected since 1548. Other locations to find agate are Uruguay, Brazil, United States, Mexico, Madagascar, Italy, Egypt, India, China, Scotland. Moss agate enhances concentration, persistence, endurance and success in one's endeavors. It is an abundance stone. Moss Agate strengthens in times of stress. It is helpful in relieving sensitivities to weather and pollution. Midwives use it to assist in successful birthing. It is used to speed up recovery, conteract long term illnesses, cleanse the circulatory and elimination systems. Crystalline quartz in shades of purple, lilac or mauve is called amethyst, a stone traditionally worn to guard against drunkeness and to instill a sober mind. 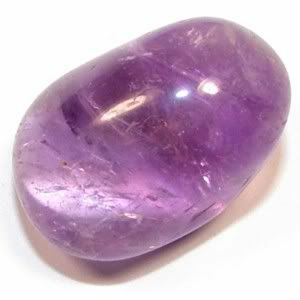 The word amethyst comes from the Greek meaning "without drunkenness" and amethyst is beleived to protect one from poison. 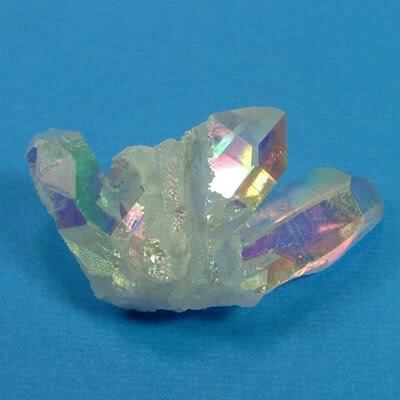 Angel Aura Quartz is an uplifting spiritual stone that invites angel guidance, deep peace during meditation and purification. Angel Aura promotes joy, light & optimism. Angel Aura is a color enhanced crystal that has been treated with vaporized platinum, silver and other trace metals to give it the shimmering colors of gossamer angel wings. The bonding process makes the color permanent. These clusters are from Corinto, Minas Gerais, Brazil and contain 15 layers of metallic oxides. This stone is formed from celestite that has been compressed for many millions of years. 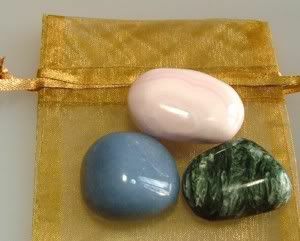 Healers use angelite to unblock energy pathways. It can be used for relief from throat inflammations, and to balance the thyroid. 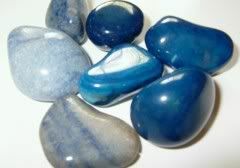 Angelite also repairs and soothes tissues and blood vessels. It is very useful for weight control. *Until very recently, the world's only source of this bicolored natural quartz is the Anahi Mine located in the jungles of Bolivia. It is rumoured that the mines where first discovered by native Indians in the seventeenth century. The Bolivian government declared the land a state reserve and built a fortress near the mine entrance. Despite its remote location, ametrine (as well as natural amethyst and citrine) made its way across the border to Brazil. These goods were then sold as Brazilian products. This caused a change in the government in Bolivia in 1989. The rights to the mine were sold, and during the past decade, these collectible gems became available on the domestic marketplace. *Miners in the Brazilian state of Bahia are finding small amounts of this combination amethyst/citrine. Ametrine is among an elite group of gems, because as of now there is just one source of this treasure in the world. You should add an ametrine to your collection now, since its future availability is uncertain at best. holy moly thanks mara!! i will have to go thru all of these and see if it can help me figure these out! 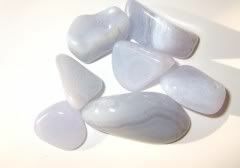 Blue lace agate is one of the rarest and most popular of the agates. This is a calming, uplifting stone. The blue color strengthens the function of the throat chakra and encourages peace. It can be used wherever there is a build up of painful or irritated energy. Wear or carry blue lace agate for peace and happiness. Place it in your hand when you feel the need to de-stress. If you find yourself in stressful situations at work or home, keep some blue lace agate on your desk and simply gaze at it for relief. Blue quartz crystal is a soothing, stress-relief stone. It assists in the ability to reach out to others. Like all quartz, it can be used as a power amplifier during magic. Blue quartz is especially fine as a peace or tranquility stone. 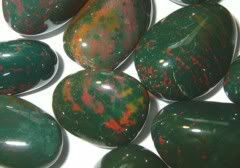 Bloodstone (also called heliotrope) is green with distinctive red spots that resemble blood, giving this stone its name. The bloodstone was used to stop bleeding especially nosebleeds. There is a legend that says the bloodstone was formed from the blood of Christ dripping on the green earth and solidifying. It was also called heliotrope by the Greeks and was thought to bring change. The bloodstone has been used as an amulet to protect against the evil eye. Bloodstone is the symbol of justice. The bloodstone is used for circulation of all energy in the body and helps to remove energy blocks. Bloodstone is used in the alignment of all the centers of the body. A healer must do this alignment while the patient lies on his stomach. It also aids in the circulation of blood. 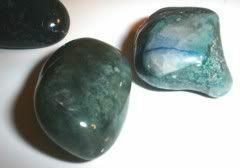 It is good to have several pieces of Bloodstone in the home to increase the flow of life energy. 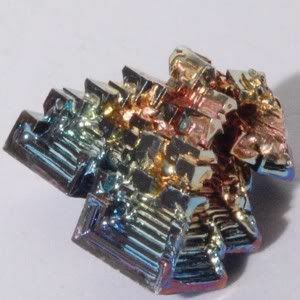 Bismuth is a lab-grown chemical element. It contains all the colors of the rainbow in a maze of colorful iridescence. Though not a natural stone, some use bismuth in meditation to find the way, or solve a personal puzzle by gazing at the maze of colors and shapes to find answers. Bismuth makes a colorful addition to any gemstone display - around candles, with clusters or in a bowl of stones. Use it to add color to your day! Blue aragonite is a gentle stone that is used not only to calm one's emotions, but also to intensify enjoyment in all emotional states. 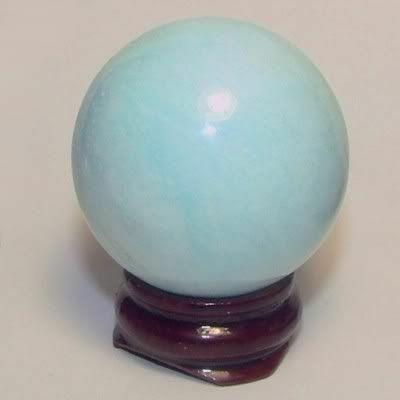 Intensify emotional perception and joy with blue aragonite! It banishes the fear of feeling unwanted emotions and opens renewed abilities to feel all one's emotions. This is a healthy alternative to suppressing one's emotions (numbness) due to fear or pain.